Keep things in perspective! As I get older and I hope wiser (debatable at times) I tend to preface what appear to be important decisions at the moment with this thought “Will the world end if…..?“ If the answer is “No,” then I don’t sweat it! Usually. For an “A” type personality, that is a huge step towards sanity. But it sure helps sort priorities in a world where everything is an emergency and we have to seek out the good news! Hope everyone enjoys their Thanksgiving feast. Take a moment to count an give thanks for your blessings! We’re still at the horse shows. The Duke shows are waning and the UNC is coming up. There was a HUGE crowd at the Duke Grand Prix. Great fun!. See our schedule to see where we will be next. Steve’s oil paintings increase in popularity! If you would like to be on his mailing list for newly completed work and have a chance to see what he has before the galleries take them or they go on our website, just email him at sfilarsky@aol.com. Since no one can spell Steve’s last name J he has added an easier URL to his site which is called, appropriately enough, HorseShowArtist.com. Per requests, he is also traveling to barns to paint on location. Again, just email him to work out a schedule. I will be adding a section each month to the newsletter highlighting and linking to specific barns. Our newsletter goes out to over 500 subscribers (and it’s growing) all over the country. If you would like to include your barn, farm or stable, no matter the size, just email a nice little story about it and a link. So many of our clients are horse owners in all disciplines and all breeds and it is a nice opportunity to let people know (who may otherwise not know) that your place exists! So, we have a new heading (see below)! 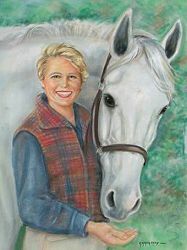 Theresa’s note: I have been fortunate enough to be able to create a number of portraits for owners and boarders at this large barn located in what used to be, the outskirts of Raleigh, NC. Owner, Caroline MacNair Carl is an amazing woman who, for years, has managed a thriving horse business while taking care of her husband. The passing of William Carl last spring has not reduced Caroline’s challenges. Read her comments below and then visit the Barn’s website and help MacNair’s in their battle against encroaching urban sprawl! It is a land battle that will threaten ALL horse farms in the next decade so see what steps can or need to be taken! Carolyn’s words: MacNair’s Country Acres has been called the “best kept secret in Raleigh.” Established 40 years ago, MacNair’s is a beloved institution that is currently teaching its second generation of Wake County’s children safe horsemanship and good citizenship. Caroline MacNair Carl and Nancy Demus have developed a world class riding school that provides opportunities for children and adults to enjoy a lifetime of equestrian sportsmanship. We are currently exploring avenues to ensure the preservation of our 200 acre farm in perpetuity, and are seeking your input. 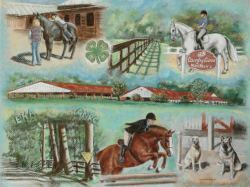 PLEASE visit our website www.macnairscountryacres.com and tell us what MacNair’s Country Acres means to you and your family, and why you believe this unique farm and riding school experience should be passed on intact to future Wake County riders. Well, yes this is sort of new too! But I just saw it and it is an amazing video about the rescue of over a 100 horses in the Netherlands earlier this month. Add the sound and , OK, I admit it, some Kleenex, and you have a perfect “you gotta see this video” moment to forward to all your friends. Being “horsey” really doesn’t matter. Judging from the emails, last month’s laugh was a big hit! Let’s jump into another video to lighten your day. This one is for all the DOG people out there! Quote of the Day: Never underestimate the wisdom in these time honored and proven quotes!